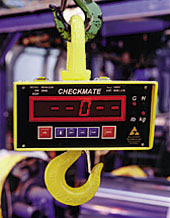 The Checkmate™ Crane Scale system provides an accurate weight reading with oscillating loads. The crane scale is enclosed is a steel containment vessel and has a 500% safety factor, making it ideal for the harsh conditions in metal centers, warehouses, shipping docks, foundries, and other applications. Standard on 30K capacities and higher. Optional on 1-20K Models. Forged, heat-treated hook & eye/shackle.